Dance leotards, tops, skirts, pants and dresses for all ages and levels. Ballroom & Latin There are 31 products. Black spandex 3/4 sleeve dance leotard with crotch liner. Designed for character, lyrical, modern, contemporary and latin dance. 90%Polyester, 10%Spandex. Black spandex asymmetrical dance skirt with pointed panels and elastic in waist. Designed for character, lyrical, modern, contemporary and latin dance. 90%Polyester, 10%Spandex. Black spandex 3/4 lace sleeve dance leotard with crotch liner. designed for character, lyrical, modern, contemporary and latin dance. 90%Polyester, 10%Spandex. 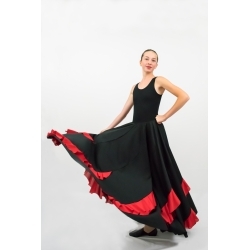 Black 8-gore knit Flamenco skirt with contrast red flounces. 100%Polyester. Adult's sizes: XS, SA, MA, LA. Skirt lengths: XS-35", SA & LA-37"
Black spandex loose comfort loose fit pants with high/fold-down waistband and flutter split at the side-seams. Great for training and rehearsal. 90%Polyester, 10%Spandex.